freeform custom cot quilt in progress, just for a little pretty in the post. • so i've been invited to be a part of magnolia square this may, which i'm super excited about and want to do soooooo badly, but the days and hours that it runs are causing me some probems. what does one do with a small child for two weekdays? especially with no immediate family nearby and the fact that mae has never been left with anyone outside of our own home? i know i have friends who would offer to take her but i have no idea if she would nap for anyone else (it's hard enough for me to get her to sleep) or if she would just be a cranky terror all day. it worries me, i hate to put anybody out, ever (except maybe my husband but, you know, that goes both ways - he's going fishing AGAIN this weekend). • we've been discussing adding another baby to the family and, while i'm pretty sure i do want more kids, the idea of being pregnant again, giving birth again, and having a newborn again frankly almost makes me break out in hives. wer're all just barely getting enough sleep now as it is, barely getting the housework done and i'm just barely finding enough time to work - add another baby to the mix and i just foresee chaos. and tears. it's scary stuff. i'm obviously not ready yet. • and on a much less personal level, i'm working on a pattern for some baby leggings for mae and am puzzled at how to hem those tiny little legs. they don't stretch around my sewing machine arm - any tips? i heart that quilt. man - if i could just spend a minute swimming around in your fabric scraps, i'd be one happy girl. adding another baby to the mix. it's tough. but oh! so worth it... plus mae is pretty darn cute. imagine another! The Baby question is too hard for me but leggings are easier. Its been a long time since baby leggings were made in this house..
You will know when you're ready for the next bub - you just will. Babyhood is just a season in our lives, be that good or bad. I feel exactly the same way about leaving my kids with anyone, so I rarely do. But when I've had too, I am ALWAYS surprised at how well my kids have gone down for naps, how they've behaved probably even better than usual! Maybe hubby can take those days off or maybe you could get a friend to look after bub at your place, so it's not so much of a change? That quilt is gorgeous BTW! As for Magnolia Square, have a practice run with a friend with Mae, well before hand. If it doesn't work, try again. If Mae has a routine, just make sure the friend looking after her sticks to it as best they can. If it doesn't work, the first day, Mae will be exhausted by the second day & will probably sleep lots! Good Luck. Siobhan. I feel exactly the same way - I really want to have another baby, but the very thought of being pregnant and giving birth, as well as those first few weeks and months makes me feel like I will have a panic attack! Was your pregnancy and labour as difficult as mine was? I am getting the impression yes! When you are ready you will know. I have two kids and I still find time for me and to sew and knit but it is a very different balancing act. Hemming before sewing up the inside leg should do the trick on those leggings. Oh dear I feel this could be a giant response so lets hope you don't mind unsolicied opinions. With Mae you will be surprised they will usually behave better for others than for you - some sort of evil child thing. If they have other kids too that will keep Mae interested and less worried about you and their parents will have seen a tantrum before and not be too fazed. Practice before though if you are nervous. 2nd babies, keep in mind they can take 12 months or more from deciding to birth so where you are with Mae will be so different. Every birth and pregancy is different too. Caleb, my first, was a shocking baby so I had resovled myself that for the second. Poppy slept thru form 2.5 months. There will be chaos and tears and also smiles and love and cuddles. You will know when you are ready, don't feel pressure though - there is no rush. Baby leggings I turn them inside out and sew them so they face up, opposite way to the sewing arm so that you can get around those little ankles. I will leave you alone now. and i understand the baby thing. and i thought i always wanted 3. well, 2 is just perfect. the thought of a 3rd?! hives for sure. It will be easier if they look after Mae in your house, so everything is familiar - although she was a dream child at the craft fair recently? Could you take her? But you were only doing half days, right? I have no experience here as in 5 months I have never left Ruby with anyone other than Adam - we don't have family close by either. It's a terrifying thought, cause we will have to one day. For the first 4 months I thought Ruby was going to be an only child - it was a hard, hard time, plus the birth was so close, but then she turned a corner and for the first time I thought about the possibility of siblings for her. THEN I had a horrible food poisoning over the weekend, which oddly enough brought back the hideousness of my (induced, natural) birth and I am happy to put it off for a few more years - if ever. I understand and sympathise, oh good lord. I think if we do, it will be when she's ready for school or Kindy - so I have the time to give number 2 the same amount of attention that muppet got. Birth for me the second time round is scarier than the first - I know what I am in for. Anyway, there is no cheer there, they are fortunately so beautiful that we are compelled to love them, despite the fact they are often little devils. I have not slept more than 3 hours at a time in months and months. The quilt is so, so lovely. I can't get over it, I am so (sitting here for a minute trying to think of the best word) DELIGHTED by it. It's everything and more that I hoped for. It's something I hope she treasures when she is big. Ok, end of world's longest blog comment. Childcare is hard but worth looking into and fantastic when you find the right centre/people. I am having the same thoughts about finding time and leaving Evie - she lasts about 30-40 minutes at the creche at gym now - it's taken months for her not to cry so I don't think I could leave her for a longer period of time. It is frustrating, but I'm not sure what else to do. But if I could find someone (a friend) that she was happy with I would definitely try to leave her for a day. I echo what everyone else says about babies and how they perform for mums. A great way to find really competent baby sitters is to recruit from childcare centres - a lot of them earn money on the side and they are totally used to every kind of trick a baby pulls, so you can have a clear conscience. Similar tip on baby leggings about hem first. Have you seen ottobre kids pattern mag? great basic leggings patterns there from new born up. (and T-shirts and all kinds of other good stuff). Oh that quilt! Stupendously gorgeous! Very inspiring! Ah, the second baby question! It was a hard, hard decision for me too. It sounds like you aren't yet ready. You probably will be one day, so don't worry too much. Nobody said siblings have to be close in age. You need to do what's right for YOU and your family. Hi Lesley, I love the quilt top - you do lovely work. I would give a test run with Mae with a friend - you may be pleasantly surprised. I've joined the world of blogging too, if you get a spare moment check it out. re: leggings, i don't hem them at all if i make them from stretch fabric. makes 'em a little flarey like after the first wash, which i like. Love the colours in that quilt-in-progress. Yum! On the more-babies question - it is entirely personal, but my babes are staged a good distance apart (3.5 years between first and second, shortly to be almost 3 years between second and third). It helps me to feel like I can cope again, because I couldn't have, with two little ones at once. But that's just me. With the second baby question I was worried they wouldn't be close if there was too large an age gap - so mine are 2 years 9 mnths apart and are great friends. However I now think any age gap is fine because friends with 4 and 5 year age gaps have children that adore the new baby. Equally other friends have happy kids that have only 18 months between them. Personally I struggled most with my first baby - It's easier now with 3 kids (youngest 4 months)! your post made me laugh... yes having babies close together is hard, and horrifying, and exhausting, and lots more yucky things... but it's also really, really ace! I wouldn't change mine for the world, especially at the age they are now where they are best of buds, and only likely to get closer as they get older. It's such a personal decision, but no matter what the age gap between bubs there are always going to be pros and cons. We'll chat. I'm 10 weeks away from having my second and I'm totally shitting myself *scuse the french*. Last time the birth was horrible and traumatizing. But my 1st is now 2 and much easier than a baby, when he asks when 'bubby brother' is coming and kisses my belly I know he'll love being a big brother. He's almost toilet trained and is able to do things when you ask him- usually. I don't know how I would go if he was much younger, still changing his nappies as well would be horrible. My mum tells me that 2 is twice as hard as 1 and 3 is twice as hard as 2. So that's not helpful in calming my fears. Too late now though, I guess I'll let you know how it all goes so you can judge for yourself. By the way I HATE being pregnant too. Also I saw you at the stitches and craft show and to me you seemed like a very calm and in control sort of person, I'm sure you'd handle 2 no problem- but as for getting any work done, I don't know about that. Sorry this went so long, I hope you find somewhere for your beautiful little munchkin to go while u're working. I think there are pros and cons for any age gap, but I'm aiming for 3 years... that way I'll hopefully only have one in nappies and avoid the massive twin pram. But friends with bubs close together swear that it's easier the second time, because it's not all new and second babies seem to be good at fitting in to the existing routine. Six months ago I was not at all ready to think about a baby and now it's seeming like not such a disastrous idea so maybe in another six months it will be right? Definitely something that's different for everyone though. And re: daycare / childminding - if you are thinking about doing more work and shows etc. as Mae gets older and more mobile it could be worth looking in to a day of child care / home care / sharing a nanny or something like that. I have lots of family nearby, but still hate to put people out, so a bit of daycare has been great for us and it actually taught Ali to have a proper day nap... he never used to, and now he routinely does 2/3 hours. Anyway, this is a marathon comment... you seem to be getting a few! Good luck with it all. And that quilt is gorgeous. Sorry, no real advice on the baby stuff. I guess you need to be ready to welcome another little creature into your life and family. Good luck with making life-changing plans! 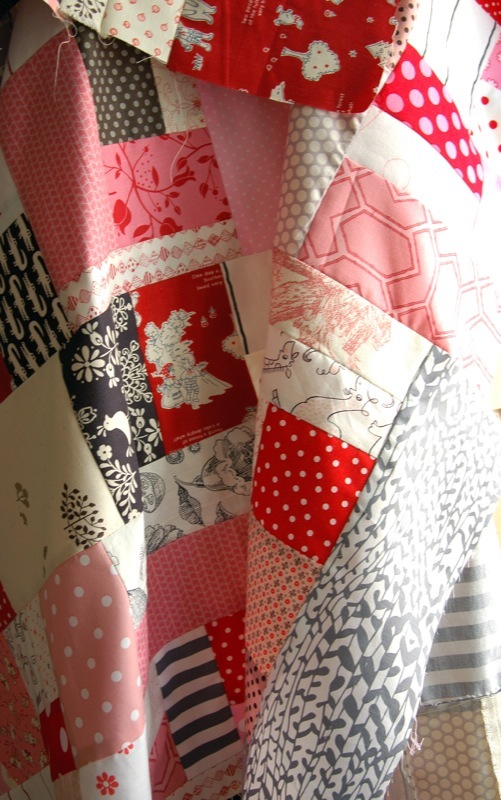 Love the quilt, totally love it! A comment for your baby fears. Babies are resilient. They learn FAST, which means she will learn fast that it is OK to nap for someone else. And you will learn that she IS OK. :) I have been there - 3 times. Please allow yourself to do something fun - for you. I promise you'll both survive. Having another child is a hard decision, but so easy really. Once you are already a part of "baby" life - diapers, feedings, napping, finances of a child, routines... just go for it and add to the joy. Really. Life only comes once. They're only little once. Sibs are so important. I never had any sibs at home. It was so pitifully lonely. But I have 3 children - and I'm a single mom - and believe me when I tell you, I've considered adopting. Even now. Little babies and their mess and their drama and their smell... mmmmmmmmm.... I would crawl around in it every. stinking. day (no pun intended, lol). If I marry again I'll gladly sign up for more, even if that means my youngest is 10. For real. Being a mommy is such a blessing. Don't let it give you hives. You can do it! You're already doing it! I applaud you for working things into your schedule for you! You have to let yourself do that. It's something I do as well - as a means to teach my kids (now 18 mos, 6, and 8) that mom is important, too. THAT. IS. A. BEAUTIFUL. QUILT. (Well it will be anyway). Truly splendiferous colours. That was a real heart post - very honest. There's some good advice in the previous comments. Some decisions are difficult to make, eh? In the interest of my mental health, we have solved the problem of no sitters in our household by my husband taking odd annual leave days. Works very well for us. The baby thing was kind of settled for us with two surprises after our first (6, 5 and 3!!!). Just remember you have 40 weeks to get used to it and your pregnancy goes by that much quicker with another little one to focus on. I know this sounds awful, but you will never sleep well until your children are much older...I have surrendered to this. But you need to be ready and that is something only you two will know when it's right. And I love your quilts. This is so lovely with reds and grays and black. Hmn, on a baby front I would wait. Mae is still so young. I have almost 4 yr old who was never a good sleeper and I am just warming up to the idea of adding to our family. There is no real reason that siblings need to be close in age. As for the Mae staying with someone else. They always end up behaving so much better for someone else than their parents. Ask around and maybe a friend will offer, maybe someones older aunt, mother,... Throw your wish in the world and solutions will come to you. The quilt is gorgeous. I could look at it all day long. You are such a wizard - that quilt is gorgeous. Wow. On the second baby front. You'll know when you're ready. When I fell pregnant with Scout, I was sooo unsure, but it's worked out beautifully, and I couldn't imagine it any other way. My little ones are such tight buddies, and they are 2.5 yrs apart, they are hilarious. Plus, the second baby is soooo different to the first. Scout is much more laid back (probably because I am much more relaxed). I was pregnant with my second when my first was 9 months old. She had been such a good baby that we thought "Yeah! We can do this again", and that was within months of us moving from the UK to Australia with no other family around us. My pregnancy was great but boy oh boy was i in for a big suprise! Number 2 was a very clingy baby, a delight but would only breastfeed (no bottles) and would only have me comfort her. I called her my little loala bear because she was attached to me like one all day every day. Then the 3rd came along, i didn't like being pregnant one bit and worried she would be the same but to my suprise she has been the easiest of them all, such a pleasure! So what am i saying? Every baby is different, as is every mother. You should be prepared to be suprised, sometimes it's hard and sometimes it's easier. Just make sure you feel ready and it will happen when you are. oh yes definitely have another baby! we started trying when my keira was 7 months old but it took us over a year to fall pregnant and then look what happened ...we got 2 for 1! its so much easier second time around as you know what to do, you know what to try to get them to sleep and they love to entertain each other. I don't have to worry about entertaining my twins because there is always someone else little to play with or watch!!!!!! love love love your quilt! the colours are great and so is your binding! I'm hoping to finish another one today but am going to back it with minkee to make it a snuggle blankie for my keira!!! I'll throw my 2 cents worth in to the ring, you brought up some bis issues that all mothers face at some stage. We also live with no family nearby & this make a HUGE difference. I also have friends who offer to help but the reality is the ones without children are a bit intimidated by the prospect of minding 2 & our friends with young children are as flat out as us! I agree that you will be surprised at how they go with others caring for them, especially if you feel confident in the carers abilities. Our best babysitter (still rarely used) is a childcare worker & nothing fazes her....it takes a lot of the worry out of it when you know they aren't freaking out (the carer that is). I had our second child 17 months after number 1. It is easier in some ways (you are more confident) but I also found it a MAJOR step up in terms of energy, pace, stress, work, juggling & sleeplessness. Now I look back & wonder why I ever found going out with 1 child difficult! The relationship between them now is great (most of the time) and I feel I am 'getting' this motherhood game so much more now, just in time for the last one (sometimes referred to as number 3). Everyone is different, no two experiences are the same. Without even factoring in the lack of family nearby, it's still really hard. I had a very easy relaxed first baby and then we tried for over 12 months to conceive Leila and were advised to consider IVF. I then had what my gynaeo described as a procedure to "blow away the cobwebs" and conceived immediately. There was therefore a bigger gap than we'd intended. The age difference hasn't meant that they're not friends, they are, but obviously at different stages. I had all the support of my parents and yet found transitioning to a second very touch. I had mild PND and it was tough - but I wouldn't change it. I know it's hard to imagine childcare, but look into occasional care - you can use that in about 4 hour blocks at a time, at least I think - it's enough to give you all a break. I would NEVER feel guilty about taking time to stay healthy, either mentally or physically, if mum isn't well then no-one is. You seem to be an amazing mum and woman, whatever you decide is right for you all, you'll continue to be so.